Handover Ceremony for Procuring Agriculture Tractor to Department of Resources and Development-Division of Agriculture, Pohnpei Sate Government. 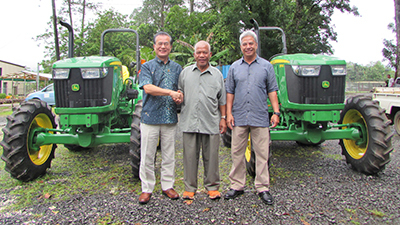 On May 29, 2018, a handover ceremony was held at Agriculture Station Botanical Garden for the Project for Procuring Agriculture Tractor in Pohnpei State which provided the Department of Resource and Development-Division of Agriculture, Pohnpei State with US$84,990 under Grant Assistance for Grass-roots Human Security Projects 2017. This Project has provided 2 tractors to improve Pohnpei Agriculture production to achieve food security and promote good nutrition. The provided tractors will be used to increase and improve local crop production to address alarming food security uses for family consumption and cash income. Also, assist the local farmers with their rising need of cash income to sustain them in business long term. In his address, His Excellency Ryoichi Horie, Ambassador of Japan stated that agriculture is a very essential sector together with fisheries for the FSM. He added that he hoped the provision of these tractors will make a contribution to the agriculture products. The Hon. Marcelo Peterson, Governor of the Pohnpei State Government expressed his deepest gratitude to Ambassador Horie and the people of Japan and added that this will enhance the agriculture sector of Pohnpei State Government. Agriculture is the principle source of livelihood for Pohnpeians whether it’s subsistence farming or little commercial farming and with the equipment it will certainly increase production of commercial farming. He said that Pohnpei is very fortunate to have these opportunities. The ceremony was witnessed by the staff of Pohnpei State Government, the Department of Resources and Development-Division of Agriculture and the Embassy of Japan.